Juicy Jays Double Wraps BANANA SPLIT Blunts add an incredible flavour to your smoking mix, and BANANA SPLIT is great flavour for everybody with a sweet tooth. 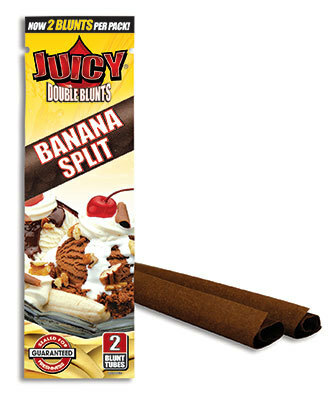 Juicy Jays Double Wraps BANANA SPLIT help you add an extra bit flavour to your blunt wrap. "Juicy Jays" double blunt pouches are packed with 2 wraps, letting you appreciate and enjoy the fantastic flavours again. The re-sealable zip lock also means that each blunt keeps fresh and tastes just as good as your first. Juicy Jays® Blunts the most flavoursome blunt wraps. What makes Juicy blunts better than all the other blunts? This is due to the famous triple-dip® flavor system that ensures the flavour is dripped on three times and left to soak for over a week, making sure when you are smoking Juicy Jays blunts each blunt is packed with flavour.